Today’s multiplex is filled with sequels to movies that last graced theater screens a decade or more earlier. These “legasequels” or whatever you might want to call them are an attempt by studios to revive dormant IP, hoping that people will be pulled in by a nostalgia-driven campaign and the promise of a return of old favorite characters. Unforgiven, which turned 25 this past Monday, wasn’t a long-delayed sequel to anything. It was a wholly original story written by David Webb Peoples and directed by Clint Eastwood, who also starred. In its own way, though, it was not only a call back to the era of Westerns – a genre Eastwood was plenty familiar with – but also a sequel of sorts to the stories those movies used to tell. It’s easy to see William Munny (Eastwood) as the older, more grizzled version of the same sort of cocky gunslinger that had been a staple of film from the 1930s, hitting their heyday in the 50s. Munny was a bandit back in his younger years, now retired and raising his kids on a small farm. One day a young man calling himself The Schofield Kid comes to Munny’s door, asking him to join him on a quest to collect a $1,000 reward. That prize has been offered by a group of prostitutes for the death of two cowboys who disfigured one of their number and was let off with merely a fine by Little Bill Daggett (Gene Hackman), the sheriff of the town. Munny reluctantly agrees and brings along his friend Ned Logan (Morgan Freeman) for the journey. The story is a long moral examination of what it means to kill a man, what constitutes right and wrong, the vagaries of justice and the long struggle with living in your own skin. Upon release it was almost immediately labeled a “revisionist Western,” meaning it more finely dealt with the implications of violence instead of glorifying The Old West as many popular films of ~40 years prior had done. The bandit whose exploits we cheered, we see, had to deal with the consequences of what they had done. Even if they were never brought to justice, they still had to live beyond the years of adventure. Things are not as simple as white hats and black hats, a point made by the story’s positioning of Daggett in something close to the role of the villain. The theatrical poster is a masterpiece of design. 1992 was a time that straddled the old days of key art that was artistic and guided by well-versed designers schooled in art theory and the coming days of “throw a few photos of the leads against a generic background” posters. This one reflects that turning point. The elements of the poster create a flow that the eye can follow around so that it takes in everything you need to know by the time you’ve worked your way around. Starting at the top left, the names of the cast are presented in descending order by status and story priority, from Eastwood to Hackman to Freeman to Richard Harris. Keep going and you see three riders on horses set against the setting sun, followed clockwise by the shot of Eastwood, shown with a gun held behind the back. Already it’s clear we’re being sold a Western here. Then the faces of the actors are shown in reverse order from the way their names are listed, each one a bit smaller than the one that preceded it. Your eye moves around the circle naturally, allowing you to take in the points that form the core value proposition – that we’re watching a Western with some incredible veteran actors – in one fell swoop. It’s all presented in dark oranges and browns, a color scheme that accurately represents what we’ll see in the movie itself. “It was a matter of honor” the narration tells us as the theatrical trailer starts. We see that Little Bill is letting a couple guys off with a punishment that doesn’t fit the crime. So the friends of the injured woman take matters into their own hands and offer a reward for the death of the offenders, an offer that attracts the assassin named English Bob (Harris). Little Bill doesn’t like violence in his town, though. Munny is recruited by the eager young man and eventually agrees to join him, bringing his partner Ned along as well, with comments made about how they’re both past their prime. From there the drama and action are amped up as we hear about how we all “have it coming” and more, Munny working his way through the obstacles in his path with grizzled determination. It’s pretty incredible now to see how hard the trailer plays up the idea of everyone, Munny in particular, being so old. Eastwood was “only” 62 at the time, which certainly puts him in an advanced demographic, but he’s continued to make movies regularly in the 25 years since. It’s not so much about age, though, as it is about experience impacting a man. That’s what’s being sold here, the story of someone who’s put so many miles behind him he’s looking forward to standing still for a bit, begrudgingly getting back on the trail. The toll a life filled with violence and vengeance takes on a man’s soul is a central theme in the trailer, as is the fuzzy nature of both right and wrong. We get the idea that Little Bill is not exactly an upright character but he also espouses an intolerance for lawbreakers and men of low character. The main message of the campaign, aside from anything about revisiting the moral consequences of the violent lives the Western genre previously glorified, is summed up on the poster: Come watch a group of highly-talented actors who you know are great in everything they’re in come together for an epic tale set in the Old West. That resonated with audiences, making it a box-office hit, and with critics as it went on to a number of award wins. 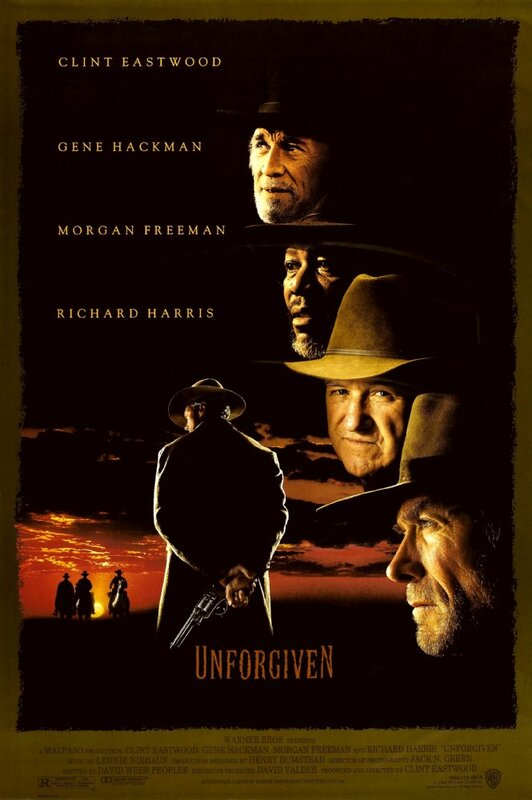 Tagged: clint eastwood, gene hackman, morgan freeman, unforgiven, warner bros.